The Pictured Rocks Lakeshore was on my places to visit list in my previous trip to Michigan but I knew it wouldn’t be practical to get there along with the other places I had on the list already. And later I figured it would be a prefect road trip during the Labor Day weekend. 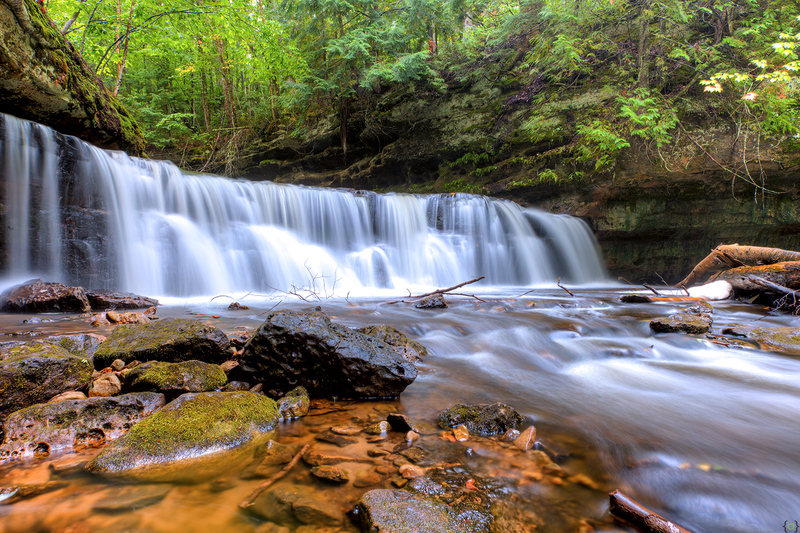 Based on my homework about this place, I decided to setup shop in Munising,MI. A small city on the Lake Superior’s southern shore. 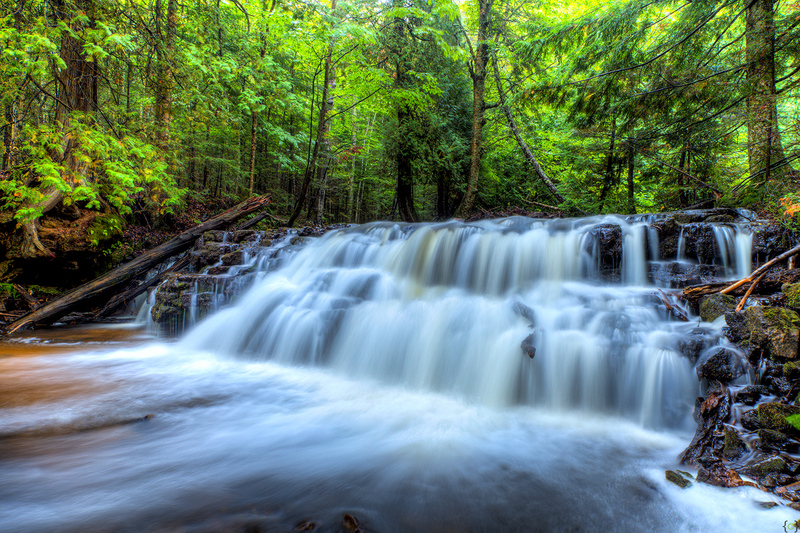 My reading also educated me, the word Munising was derived from ‘Ojibwe’, A North American indigenous language. When loosely translated, means ‘near the island‘. I left Chicago a bit early on Friday to beat the weekend traffic around Milwaukee. The 7 hour drive(remember that I lose an hour in the transition) from Chicago to Munising with a couple pit stops wasn’t that bad but it’s the detours due to road constructions sort of slowed down the traffic now and then. It’s very scenic, as the route runs a lot along the Lake Michigan. Coming to details on the Pictured Rocks National Lakeshore, it’s on the shore of Lake Superior in the Upper Peninsula, Michigan. Extends approximately 42miles, starts at Munising, Michigan and ends at Grand Marais, Michigan. And these 42ish miles is nothing but spectacular scenery. 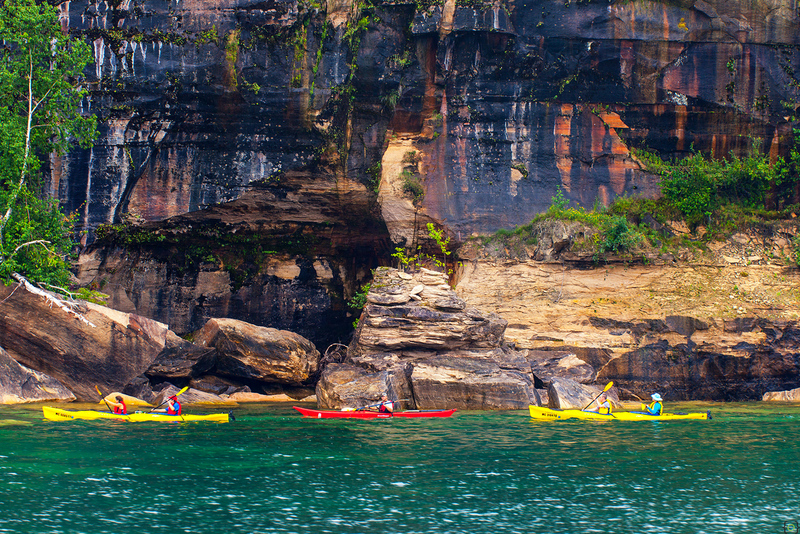 Mineral-stained sandstone, Waterfalls, Sand-dunes, beaches, natural archways, streams, lighthouse and more. 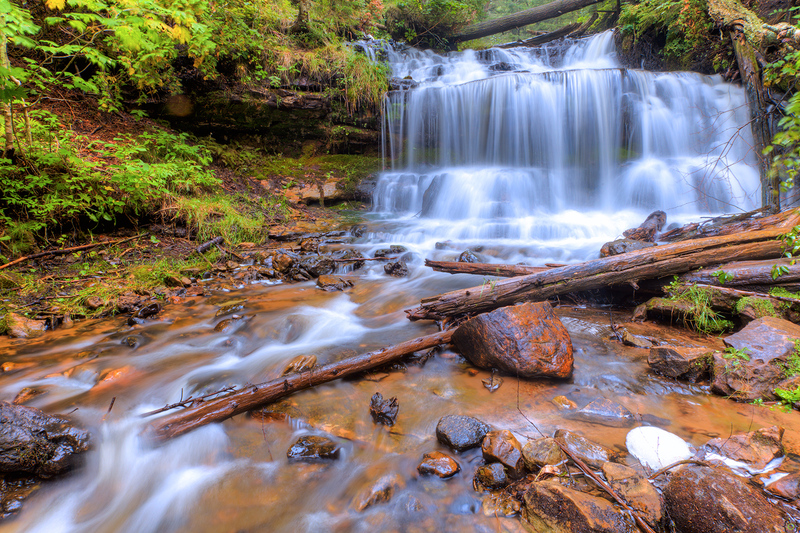 Waterfalls are a must-see when you get here. They are in every variety. Tall, Short, wide…But each of them is nothing short of the words, breath-taking. 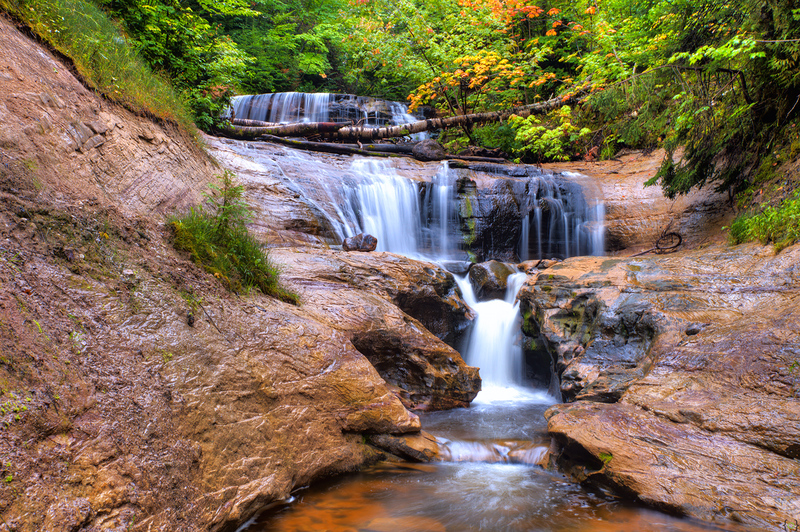 There are 17 waterfalls in and around this region of Pictured Rocks National Lakeshore. Some of them really hard to get to but a whole lot of them within easy walking distance. If you are into hiking, the ‘North Country Trail’ covers all the 42 miles along the lake shore with lots of amazing viewpoints all along the route but there are also a handful of day hiking trails which leads to waterfalls and beaches with little effort to no effort. One of the places which is really easy to get to and is also worth spending time is the Miners castle. Has a well maintained pathway, rest-rooms, a souvenir shop and a couple of park rangers, in case you need help. There is also a beach close by which was really crowded when I was there on Sunday. 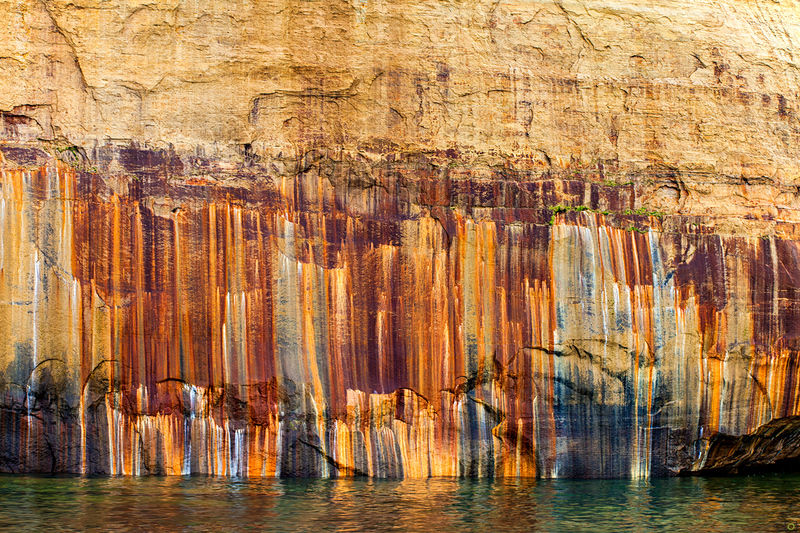 Another ‘not-to-miss’ experience when you are up there is, seeing the Multi-colored sandstone cliffs or the pictured rocks from up-close. 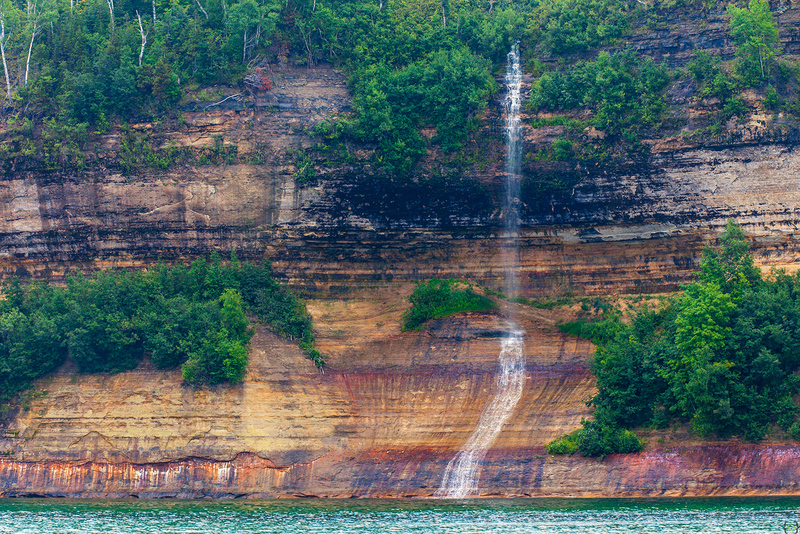 There are a couple places based in Munising which do a variety of cruises during the high season, I took the ‘Pictured Rocks Cruises‘ which was reasonably priced and the crew were very friendly, they also offer pop for a dollar each. Trust me, the cruise experience is well worth the money spent if you decide to take this cruise. The week(Starting Aug 24th), When I was researching on this place there were lot of chatter on solar activity on the websites I follow and I kept my fingers crossed thinking I’d get to see the Aurora Borealis(The ‘Northern Lights’ for those of you, who got C in physics) But when I saw the rain and clouds after reaching Munising, I lost hope. But as I said earlier, Sunday afternoon was beautiful. I spent most of my time at the Miners beach…Blue sky and turquoise waters… Sounds great… Doesn’t it? It’s one of those places that you have to be there to see how beautiful it is. My hopes got up a little, as I saw the blue skies and I’m also aware the skies are really dark up here as there is very little to no light pollution. 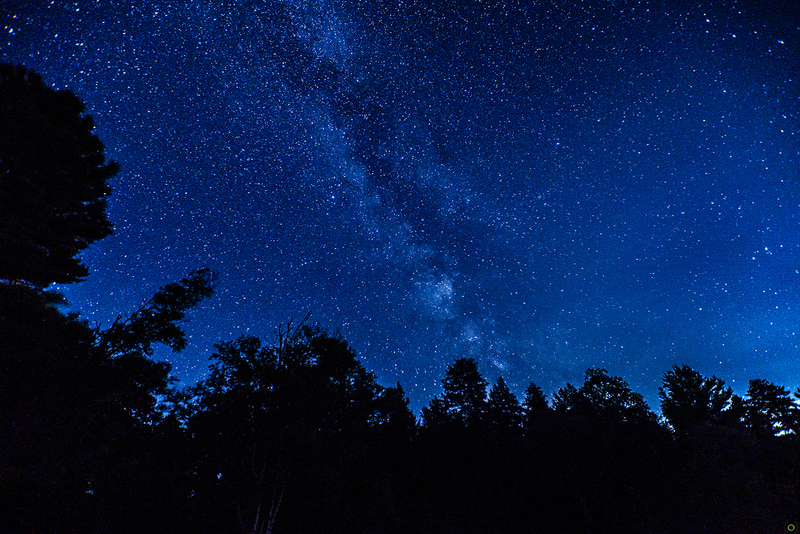 So, I stayed late at the beach near the AuSable lighthouse to see the night sky light with a gazillion stars and the milky-way rising. Right around midnight, while I almost lost track of time looking at the Milky-Way…I happened to look north-west and there it was. I’m not sure how long it’s been there for. The green/purple and bluish green lights just floating in the sky. The picture below from that scene doesn’t do justice though. If you are on a budget and have the desire to see the Aurora Borealis, if the trip to Iceland seem a little far-fetched… Check the NOAA website for the forecast and if it’s around new moon days, even better.. Make a trip here. 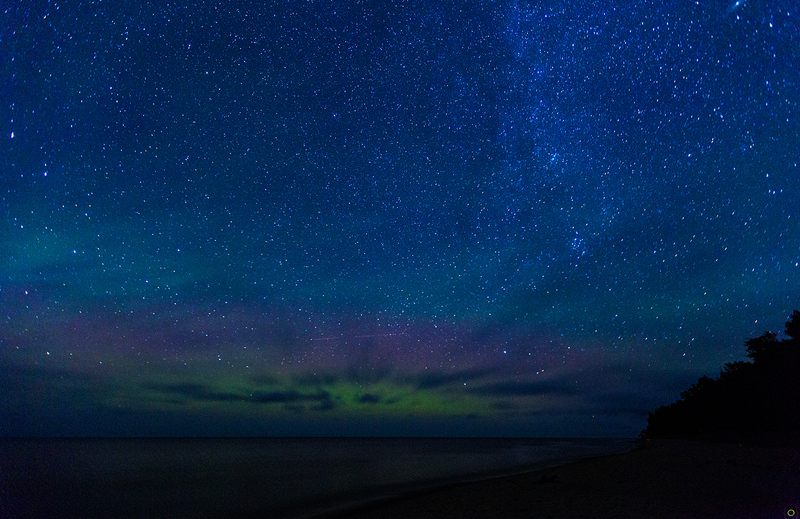 The Upper Peninsula, Michigan is one of the few places in CON-US where you can see the Aurora Borealis. Winters will probably have more clear skies and less humidity which raises the chances of seeing the Milky-Way and if you the lucky enough, even the northern lights. The shots from the trip are below. Enjoy. WOW! You are not only an excellent photographer – but an artist of exceptional talent. When I looked at each photo I wanted to get out my paints and paint the colors. It was very emotional for me.